Mauve Pagé is Publication Design lecturer with Publishing @ SFU, as well as the principal of Page & Design, her own book design and consultation firm. Over the past ten years, Mauve has worked as in-house designer for both large commercial presses (including Penguin Canada, Harbour Publishing, and Whitecap Books) and small local ones (such as McKellar & Martin, Talonbooks, and TouchWood Editions). 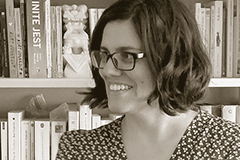 She has designed for university presses (UBC Press and Oxford University Press Canada), and for journals and magazines (L’Actualité; The Coast, Geist). She specializes in illustrated books such as cookbooks and children’s books. Her work has been recognized by the Alcuin Society Awards for Excellence in Book Design in Canada, PubWest Book Design Awards, and Gourmand World Cookbook Awards. Mauve holds a Master of Publishing degree from SFU, a Bachelor in Communication Design from NSCAD University in Halifax, and a Bachelor in Women’s Studies from Queen’s University. She is happy to join Publishing @ SFU where she teaches PUB 231 (Graphic Design Fundamentals), PUB 331 (Graphic Design in Transition: Print and Digital Books) and PUB 602 (Design & Production Control in Publishing). She hopes to inspire students to find creative solutions through conceptual thinking, and get them excited about the unlimited potential to communicate ideas aesthetically. Mauve is originally from Montreal & Ottawa, and she is a fan of goats, baking bread, knitting, and bookbinding. She lives in Vancouver with her partner, young daughter, and her dog, Riker.